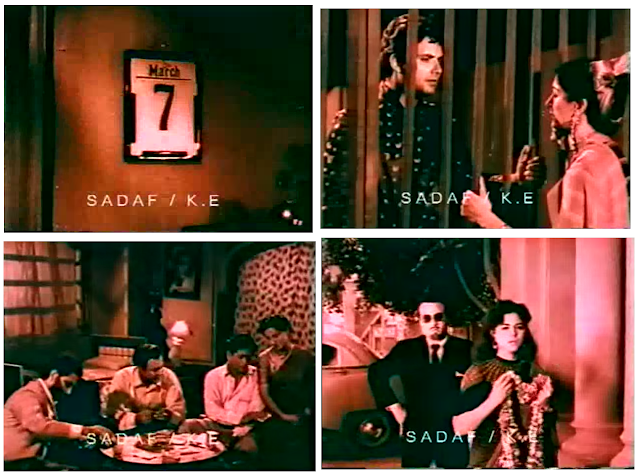 Even though Betaab seems to have been massively popular at the time ... I've never heard anyone recommend it or discuss it by name. So maybe we should talk about what makes this film stick out from its peers ... even 30+ years later. Separated childhood friends Sunny and Roma (Sunny Deol and Amrita Singh) meet again as adults in ***Betaab Valley, when Roma returns for holiday . He's a devil-may-care rancher, she's a devilish heiress. He realizes who she is. She has no idea who he is. But, of course, she takes an immediate dislike to his impertinent ways. They bicker and almost kill one another and she deliberately destroys all the out-buildings on his farm. 'Course, when Roma's found out, she's also "forced" to stay on the farm to repair the damage and by extension, get to know her childhood friend all over again. Turns out, the two families have a messy history (duh). Scenes from The Man From Snowy River (released just a year earlier) may be invoked. Etc. Etc. I am in love with this monstrosity. ... a well-paced script from Javed Akhtar, and A LOT of Sunny Deol. (Like there's chest hair coming out of the seams, and maybe check your viewing device for stray fur balls at interval). Luckily, this is taazi roti-Sunny, just out of the film industry oven, and relatively free of the stiff mannerisms of his later days. [Or romances with co-stars a third of his age: *ahem* I Love NY.] The director did everything he could to exploit the family genes, it seems to me. 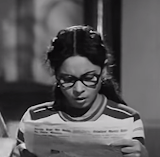 Sunny is really the sexualized debutante in this production, and groomed bachpan-se, too. You can tell just by his frequently donned short-shorts, signature Deol wear that could only be more of a tradition if they weren't so much shorts as a robe or a blacksmith's skirt. A smart business move, as he was the star kid from a massively publicized family scandal, and people were more likely to be heading to the theatre to see Sunny, Dharmendra ka bacha, than a potentially disposable new starlet. (I mean did anyone see Heropanti for a better reason?) Still, he's not just a pretty face, either. His horsemanship is to be envied, and his comedic timing is pretty good, with the exception of some poorly-advised fake laughter. Amrita Singh clocks in a debut performance as the heroine. Though she's rough around the edges (especially in her early dialogue delivery) you can't quite look away from her theatrics. My favorite thing about her is that she's believably vicious. Something about the look in her eyes and her cat-like way of lunging makes her scarier than the average romantic lead. Hema could use a whip, and I hear Amrita gets one of her own in Mard, but I don't really think she needs anything but her finger nails do to serious damage. That is, until she sheds some of them in the second half. If you like Bollywood heroines to be more riot grrrl than girl-next-door, you'll probably like her. Frivolous though it may be, I also have to mention that she wears the hell out of a pair of trousers...the staple of her wardrobe throughout the film (she never switches to saris). Also, Amrita was one of the best things about the recent 2 States (2014) for me, so it was fun to see how she got her start. The well-matched physicality and athleticism of these two leads certainly must have contributed to the film's success. When they're not riding bucking horses, tumbling in the grass or hay or in the water or in the mountains, they're jumping off of roofs, throwing chickens, catching chickens, and playing chicken on the road ... jeep vs. truck vs. hairpin curves. Really, some of the action made me nervous, especially the dubious horse stunts. 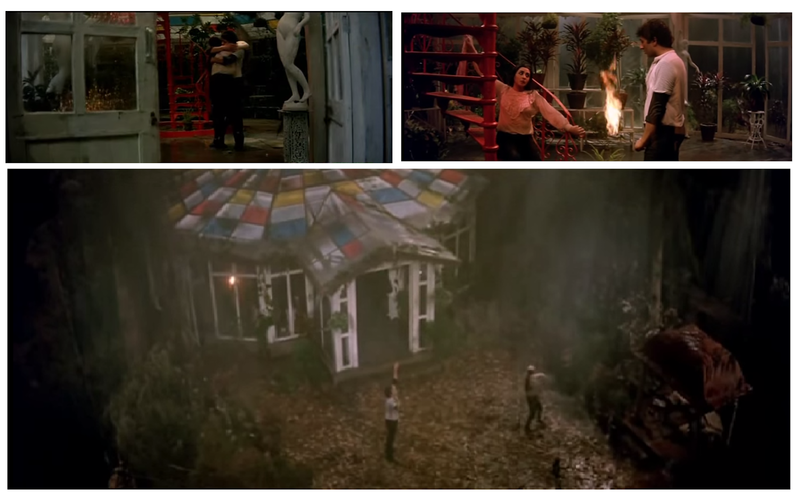 I'm not sure how much of it was stunt-double work, either, which points to either excellent framing and choreography, or terrible safety practices. Pretty sure that's actually Sunny. Mithun did a similar stunt the year before in Aamne Samne, clearly Bollywood was obsessed with Raiders of the Lost Ark (can you blame them?). If you're looking for '70s standbys, you will find Prem Chopra and Nirupa Roy once again in comfortable roles (though leaning more toward portrait than caricature, here) as villain and matriarch. It also occurs to me that they had 2-3 x longer careers in same-same supporting roles than Sunny had in the lead ... but maybe that's to be expected. Shammi Kapoor brings a human sparkle to the alternately gruff and benevolent crorepati. Annu Kapoor also shows up for a welcome and touching role as the family nauker; a self-described "chhota aadmi" who still manages to help his favorite rude heiress out in a time of need. "Here comes the dog, strong and brave!" "You gave each other a pledge? Unheard of, absurd." Values-wise, I appreciated the attitude towards parental authority in this film. As far as I can tell, Roma doesn't spend any time feeling guilty about her father's disapproval of her romantic choice, and neither Roma nor Sunny put up with patriarchal abuse. Worlds away from DDLJ, thank God. Sunny does cook up a bit of a taming of the shrew project for Roma, but it hangs more upon natural consequences than his will to dominate. He just wants his friend/sweetheart back, which is about as innocuous as it gets. And even when she's a bit tamed, she doesn't lose her edge entirely, or give up her ability to make decisions for herself. So, ok, this film doesn't do anything new, but perhaps that's too much to ask of a star-launching vehicle. Even so, it's pleasant-viewing, with few of the usual wasted scenes, and creative wide-shot cinematography. You may or may not like the six R.D. Burman songs... for me they were just so-so. Still, Betaab has the gleam of new talent and the support of the old, and enough is as good as a feast. And the dog, did I mention the dog? I know some of you are thinking, BUT WHY? Recently, when a former prof of mine compared Sunny's career in the 80s to some commercial (but critically ignored) mass hits of the 50s, I had to laugh. But I realized I couldn't in good conscience continue to giggle about Sunny without experiencing the height of his stardom for myself. Now that I have, well, I wouldn't mind seeing more ... maybe even films that better fit the "obscure" half of the "obscure hit" equation.. But I draw the line at ... No, actually, I have no idea where I draw the line anymore with Hindi films. The minute I draw one, I resent it and immediately want to see the other side. All you have to do to get me to try a new category I have vowed not to watch is to talk it up while I talk it down. Eventually, the curiosity will get the better of me. ***Did you know that the Kashmiri valley was named after the film, not the other way around? Thanks, A.B.! That's going to end up in my South Asian geography unit next year, I can tell you that. Note: I saw this on a whim, so pardon any mistakes in details from a lack of subtitles (though the Hindi is easy to follow and anyhow, you really don't need to understand the dialogue to understand this film) and the sub-par cropped screen caps. "Finally" the first Pakistani film I've seen that can rightly join the ranks of the South Asian romantic comedy (with classics like Chori Chori, Mr. and Mrs. '55, some 70s and 80s middle cinema, Chupke Chupke, etc. 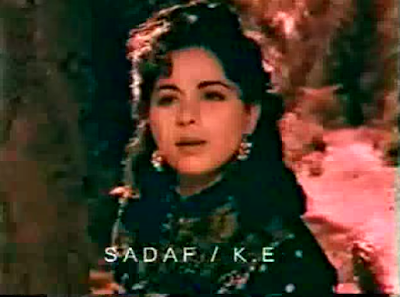 ), Saat Lakh (1957). As it stars Sabiha Khanum and Santosh Kumar, the first couple of 50s Pakistani cinema (and married in real life soon after this film released), I was certainly expecting sparks. And that's about all you get in Saat Lakh. Sparks, but never a fire. The hook did bode well. Kausar Banu (Sabiha) is an orphaned heiress who is compelled to marry (by one of those pesky parental clauses) to inherit a fortune of 7 lakhs three times over in land and assets. It seems that if she doesn't, her brother (Himalaya Wala), a boozy gambler will inherit instead. Though she hates the institution of marriage, she's compelled to take the will's stipulations seriously. Despairing to find a feller on the sunny side of 60 (perhaps because of her haughty temperament, perhaps because her brother's reputation) Kausar runs into a bit of luck, or rather luck runs into her, when a young man (Santosh) pursued by the police climbs through her window. Strangely, the man, Salim, admits to being a suspect in woman's murder, but he begs for her assistance. Clever Kausar sees the opportunity. She offers a deal. She will cover for him when the police arrive, but only if he agrees to marry her. Salim hesitates (resenting her power play), but when the police knock at the door, he's ready to repeat "qubool hai" and "manzoor hai" with the best of them. The two get married that evening, and Kausar discusses the situation in private with her lawyer. They come up with a plan. She will take hubby to her bungalow in the mountains for the necessary first few days of marriage. After three days, vakeel-sahib will call the police and tell them to arrest the new husband, and Kausar can settle down happily ever after with her cash. Of course, as soon as the newlyweds arrive at the bungla, it is clear that Kausar will have to work to keep Salim in the dark to what their marriage really is. The separate rooms certainly give him a clue. BUT in heady hill station air, anything can and will happen. A few days at the bungla, some triangular drama with a local flower seller and dancer (newcomer Neelo, whose career was launched by the biggest hit of the film, Aaye Mausaum Rangeela) . . .
. . . a snake, and a thunderstorm, all bring the two newlyweds into a state of mad sexual tension. Kausar also starts to realize (duh) that Salim can't possibly be a murderer. Things almost certainly would have escalated, except that Kausar forgets how many days have passed. When she realizes that it is the calendar date of the police's arrival, she tries to call off her vakeel, but is too late. (Darn vacation house hours.) The police are already at the door. Kausar tries to explain away the charge, but to no end. Salim is carried off to jail. It's the second half that tells us whether or not Salim is actually a murderer, whether he will be acquitted, and surprisingly more extensively, how many bewafai songs will have to be sung and virginal tawaifs sacrificed before he can forgive Kausar of her actions. Also, shady brother and his drinking crew must be defeated. Sadly, much of what is worth seeing in this movie takes place before the last hour. I can give the film the benefit of the doubt that perhaps the dialogue was more interesting than I could appreciate, but the plot itself was painfully old hat. Two or three songs in the second half, however, were brief oases. I read somewhere that the unusual thing about Salim's bewafai song is that his lyrics talk trash about the heroine ... during a time when songs tended to idolize lost loves. 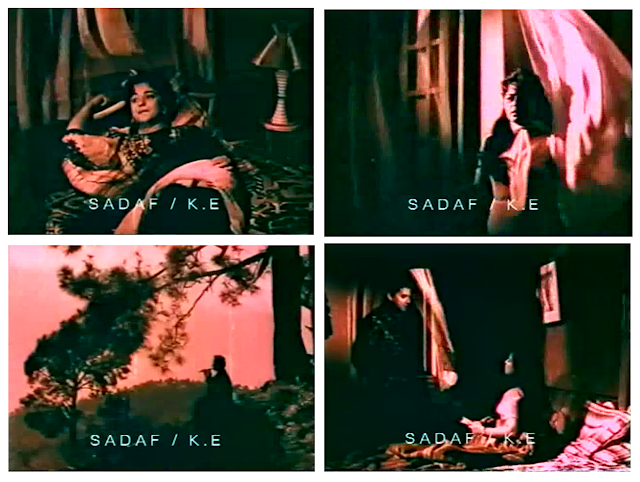 This brings me to the aspect of the film that was most enjoyable--Sabiha's flawed heiress. When industries put women on pedestals, trying to catch a glimpse of the being at the top sometimes gives me a headache. But Kausar is not the dangerous vamp or the good town girl or the seductive dancer only existing to stoke jealousy between would-be lovers. She's messy, and I like that in people. This helps the portrayal of their mutual attraction. It's just not as safe and guarded as I expected. He spouts some funny lines before trying to make a move (something about how "this is SO not how a suhaag raat is supposed to go") and after rejecting him, she slinks around the bungalow the next day, barely able to keep her growing interest in check. When he meanders off to the woods, she follows him and communicates with him frankly ... commenting on his bad mood and pushing him towards the reaction SHE wants. In general, this is a character reminiscent of early Nargis or Katherine Hepburn roles ... where the woman is powerful and intelligent and confident, but desperately needs some basic human kindness added to the mix. Since she's allowed to be a sensual being, and since we are allowed to see her fight her feeling of burgeoning love for personal rather than religious reasons, it's easy to be invested in her side of the story. *Spoilers* I get the sense that she is reformed a bit in the second half, but mostly the two lovers are ultimately reunited because others force Salim to confront his misunderstandings. Santosh is pleasant to look at and has a good presence ... I only found him lackluster during the admittedly formulaic later scenes. 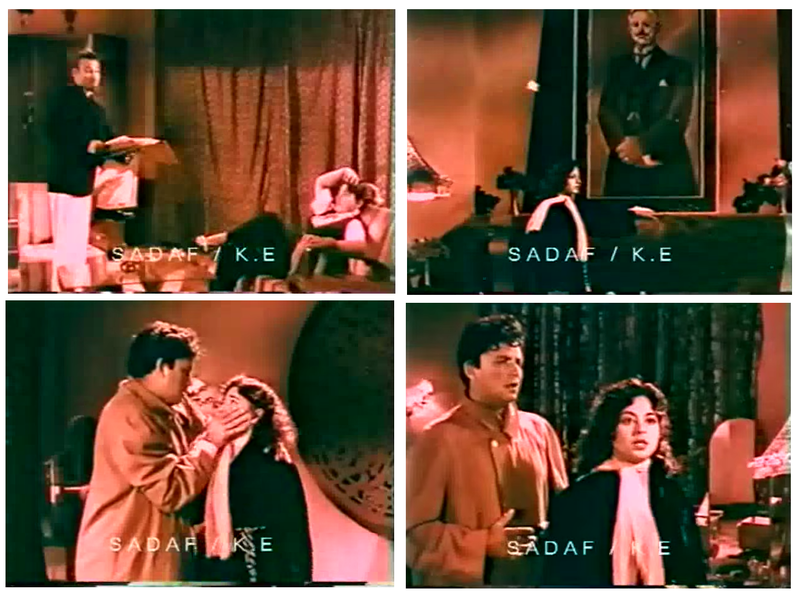 But his role pales next to Sabiha's in this film, so it's hard to tell exactly what else he has to offer. If nothing else, I'm sold on their onscreen partnership. Ooh la la. *No subtitles here, so please forgive any errors in plot or analysis!